probe panel constituted by the Inspector General of Police, Mohammed Idris, to investigate the violence that took place during and after the December 10, 2016, National and State Assembly rerun election in Rivers State. 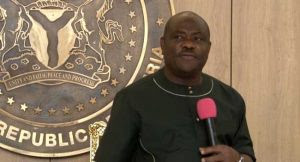 Delivering judgement in the suit filed on January 11, 2017, by the Rivers State Government and Governor Nyesom Wike, Justice Kolawole said “the police panel was unknown to law” because it lacked constitutional backing. Consequently, the court held that the report of the panel was not valid and of doubtful source. The trial judge also held that it was wrong for the IGP to constitute a police panel that had the Department of State Security as member. Justice Kolawole noted that even though Section 4 and 11 of Police Act, allows the police to investigate allegations of crime, the law stipulates that the it will require presidential assent for the police to delegate power to another prosecutorial agency. In view of this, Justice Kolawole said it remained to be seen whether the Attorney General of the Federation and Minister of Justice, would prosecute those indicted by the police probe panel based on an illegal report.